VERDI CHORUS GALA "Passione! Opera!" Presenting the fully staged fairy tale opera "Cinderella" in Italian with super-titles. 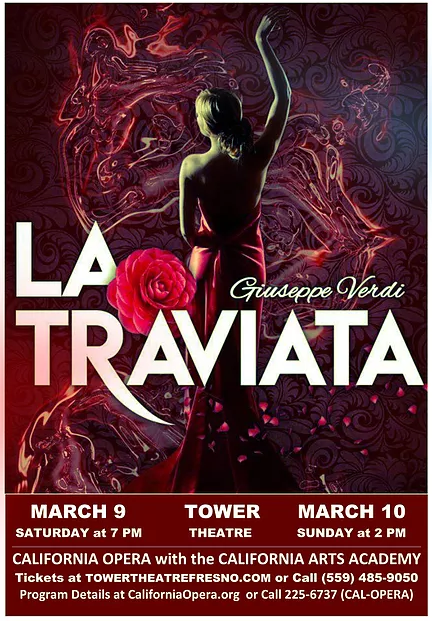 Expansive new grand production featuring world-class singing, new traditional sets and costumes, fantastic dance, and a nationally acclaimed cast led by baritone Gabriel Manro as Curly opposite soprano April Amante in the role of Laurey. Presenting the fully staged fairy tale opera "Cinderella." The European fairy tale about a young girl and a Big Bad Wolf (Gabriel Manro) composed by Seymour Barab, musically advancing its characteristic comedic charm. Dr. Harvey Edmonds, Dr. Marshall Flam, and Dr. Don Gaede perform, supported by local physicians, professors, Gabriel Manro and other festival artists in an inspirational musical extravaganza to benefit St. Agnes Hospital. International opera artists perform their signature arias and musical favorites from around the world. Presenting the fully staged dramma tragico (tragic opera) in three acts. Thanks to: The National Endowment for the Arts and the National Park Service. An “Imagine Your Parks" Project. Synopsis: This is the story of how gospel music influenced Lincoln to sign the Emancipation Proclamation. Abraham Lincoln (Gabriel Manro), his aide Sam Everyman (Michael Orlinski) and Mary Todd Lincoln (Krista Wigle) are essential to this story. It centers around their relationship with three African Americans. Lori Willis sings the part of Mary Lincoln’s closest friend, Elizabeth Keckley, a renowned black designer who never got the credit for completely refurbishing the White House in 1862. Aunt Mary Dines, a gospel singer and the Lincoln boys’ nanny invited the president to hear her gospel choir sing in a secret Forest Campground. History reports that “Lincoln wept" and shortly after that he signed the Emancipation Proclamation. Noah Griffin plays Frederick Douglass, the famous abolitionist and friend to Lincoln. Griffin sings in the opera and also is Narrator. SLO Master Chorale Orchestra. Celebratory works in honor of Admiral Lord Nelson, composed by Joseph Haydn, and victory at the Battle of Dettingen by G.F. Handel are featured. Regent Auditorium will overflow with some of most symphonic opera music ever written by Mozart. Mozart's comedic love story of two couples is sure to tickle your heart, as it has countless opera-goers since Cosi fan tutte's first performance at the Vienna Burgtheater on January 16th, 1790. In setting this new production in Americas of the 1950s, director Dylan F. Thomas twists the traditional story of "The School for Lovers" to include teaching a lesson not only to women but to the men as well. Featuring baritone Gabriel Manro as Sharpless, Japanese soprano Miwako Isano and Russian soprano Olga Chernisheva sharing the double cast in the title role, and tenor David Gustafson as Pinkerton. This classic tale of unrequited love between a Japanese woman in Nagasaki an American Naval officer is one of the most beloved operas written by Puccini. This production features choreography that incorporates delicate Geisha footwork, fans and movement. The Madrid Theatre will overflow with some of the most beautiful and moving music ever written. Verdi's tragic love story of Violetta and Alfredo is sure to touch your heart, as it has countless opera-goers since La Traviata's premiere in 1853. In setting this new production in Paris of the 1930s, director Dylan F. Thomas transforms the hidden illness that threatens Violetta into a portent of the horrible malignancy that will soon consume France and all of Europe. 3pm - Arrive to enjoy wines of Reynolds Family Winery, Pacheco Winery, sparkling waters and delicious hors d'oeuvres...plus surprises! 4pm - Music Begins: Featuring mezzo-soprano Anna Yelizarova as Carmen, soprano Olga Chernisheva as Micaela, tenor David Gustafson as Don Jose and baritone Gabriel Manro as The Toreador, Escamillo. Accompaniment by concert pianist Galina Umanskaya. Introductions by GGO Music Director, Geoffrey Gallegos. These concerts will feature duets, trios and ensemble pieces from a variety of operas. The idea is to showcase the thundering voices of opera with the various combinations of female/male and high/low voice types. Buy your tickets in advance at Red Rock Books! James Barbour sits down with opera singers Gabriel Manro and James Creswell to chat about their involvement with Los Angeles Opera. A powerful tale of innocence and betrayal on the high seas. Based on Herman Melville’s classic American novella, Billy Budd tells the story of a young sailor whose unwitting actions compel his captain to make a fateful decision. Leading the all-male cast, baritone Liam Bonner returns as Billy Budd, with tenor Richard Croft as Captain Vere. Bass Greer Grimsley makes his LA Opera debut as Claggart, the master-at-arms maddened by Billy’s goodness and beauty. Continuing his ongoing celebration of the Britten centenary, James Conlon conducts an unforgettable production staged by Francesca Zambello, one of the most dynamic directors on the international opera scene. Production from the Royal Opera House, Covent Garden (London). Parental discretion advised. An afternoon of your favorite opera arias and ensembles sung by a stellar cast of principal singers and chorus. Audience sing-along and silent auction. A benefit for West Bay Opera. Don't miss it! Works by Mozart, Verdi, Bellini, Puccini, Offenbach, Handel and other composers. Gate Opera’s stellar cast returns, starring, as the rambunctious brother and sister playmates, mezzo-soprano Alexandra Jerinic as Hansel and soprano Suzanna Mizell as Gretel. The story starts in the Broommaker’s cottage in the Black Forest where the children are playing instead of doing chores. Their mother scolds them and sends them into the forest to pick strawberries for dinner. Additional featured principal artists are mezzzo soprano Anna Yelizarova as The Mother, baritone Gabriel Manro as The Father, soprano Miwako Isano as The Sandman, soprano Jacqueline Goldgorin as The Dew Fairy, and mezzo soprano Roberta Wain Becker as The Wicked Witch (Rosina Daintymouth) Stage Director is Edna Garabedian, Conductor is Maestro Robert Ashens. Singers Marin Youth Choruses are featured, portraying the Gingerbread Cookies, and Forest Sprites, Guardian Angels, Witch’s Helpers, and Magic Candy Canes who will greet you along with Hansel and Gretel when the curtain rises on the famous Gingerbread Candy House of ACT II. Enjoy the beautiful “Evening Prayer" and other gorgeous music of the world famous opera. Maestro Robert Ashens conducts, Edna Garabedian directs. Amanda Mendon is chorus director.